Art of Living Bloggers wish India a very Happy Independence Day. On our 66th Indpendence Day, let us pay our tribute to the freedom fighters who sacrificed their lives to win freedom for One billion Indians. Today let us renew our commitment to our motherland to reclaim its lost glory from the jaws of corruption and apathy. Gurudev, Sri Sri Ravi Shankar, founder of the Art of Living has said, “India can be proud of seven things and showcase them to the World – Food, Tourism, Clothing, Music & Dance, Yoga & Spirituality, Ayurveda and IT.” (Watch Video) Nowhere else in the World is such richness found. These are the things that we need to put our attention to boost our economy and the image of our country. 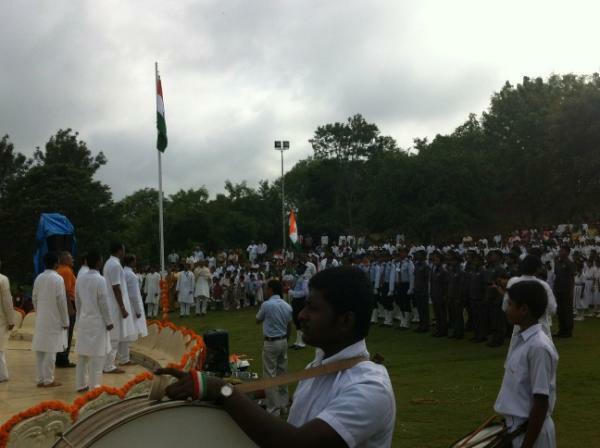 The beautiful tricolor of India being hoisted this morning at Art of Living International Centre. Let the spirit of the tricolour paint our lives with courage and sacrifice (saffron), truth and purity (white), peace and prosperity (green) and righteousness (Dharma). Here are two recipes make your dining table tri-coloured! 1) For preparing tri colour idly, cook carrots and grind it to a paste without water. Pour it in a bowl and keep it aside. 2) Steam the spinach and blend it with very little water. Keep it aside. 3) Take a spoon full of the idly batter and pour it in the carrot mixture with salt. Mix well and keep it aside. 4) Take another spoon full of the idly batter and pour it in the spinach mixture with salt. Mix well and keep it aside. 5) Spoon a little idly batter into the idly mould. Put a little spinach mixture in the centre of the idly batter. 7) Steam it till cooked. 8) Tri colour idly`s are ready. Serve with chutney. Place agar-agar strands in 3tbsp water and heat it by constantly stirring to dissolve in water. Strain it to remove any tiny strands present in it. Blend avocado and pistachios into a fine paste by adding little water to it. In a saucepan, heat milk and condensed milk. When it comes to a boil add the dissolved agar-agar and combine well. Remove from the flame and when it is slightly cooled, add the avocado-pistachios puree and combine well. Pour this mixture into a cake pan, dessert bowl or ramekin, after it cools down refrigerate to set. Blend apple and almonds together into a fine paste by adding little water. In a saucepan, heat the milk along with condensed milk and vanilla extract. When the milk comes to a boil, add the melted agar-agar to it and combine well. Remove from the flame and when it’s slightly cooled, add apple-almond puree to it and combine well. Slowly pour this mixture on top of the green pudding that has already been set in the refrigerator. Let it cool and place in the refrigerator for further setting. Blend fresh cantaloupe and strain it to get the juice out of it and keep aside. Heat milk along with condensed milk. When the milk comes to a boil, add dissolved agar-agar and mix well. Remove from the flame, let cool slightly and add the cantaloupe juice to this. Pour this mixture on top of the white pudding that has already been set in the refrigerator. Again, keep this in the refrigerator for further setting. After the pudding has set well, cut into different shapes and serve. Bhagwa or the saffron colour denotes renunciation or disinterestedness.Our leaders must be indifferent to material gains and dedicate themselves to their work. The white in the centre is light, the path of truth to guide our conduct. The green shows our relation to (the) soil, our relation to the plant life here, on which all other life depends. The “Ashoka Chakra” in the centre of the white is the wheel of the law of dharma. Truth or satya, dharma or virtue ought to be the controlling principle of those who work under this flag. Again, the wheel denotes motion. There is death in stagnation. There is life in movement. India should no more resist change, it must move and go forward. The wheel represents the dynamism of a peaceful change. Mera bharat Mahaan… Jai Gurudev! Though recipes are very simple, creative and seem delicious, I am not sure they follow the rules of Ayurveda. For example, fruits ( apple in this case ) is never had with milk. There is the use of maida in another recipe which is not very healthy. Garlic again is virudh ahaar with most things except broad beans and flat beans. I attended Kaushani Desai’s ayurvedic cooking course and learnt these things. May be the recipes can be tweaked a little here and there so that they don’t violate the laws of Ayurveda.